Lactation recipes, Indian Vegetarian Lactation recipes. Congratulations for the new bundle of joy that’s now such an inseparable part of your life. From the time that you’ve known that you are pregnant to the time that the child was delivered, a whole lot of advice on all sorts of topics from food to baby care must have poured in from all sources. But the kind of care that is needed post-delivery is a completely different ball game. With so much advice and so many tips, I am sure there must be a lot of confusion between what’s right and what’s wrong. I too had a similar phase – there was a roller coaster of emotions, where I was happy¸ confused, anxious and at a complete loss to understand how to go about this new life. One important thing that I realized was that the new responsibility is so overwhelming for you’re as a mother that you forget to take care of yourself. But remember, if you eat right, your baby gets the right nourishment! 1. Eat a variety of foods, but in moderation. Your body needs many different nutrients to stay healthy. Preferably eat foods that are low in calories and aid in milk production also known as galactogogues. The ingredients which top this list are milk, garden cress seeds (halim), bajra, fenugreek (methi), garlic (lehsun), edible gum (gaund) etc. We have a host of recipes like Halim Ladoo, Garlic Roti, Bajra Khichdi and many more to help you sail through this phase healthily. 2. Prefer Oats, whole wheat, whole bajra etc. over refined flour as the latter is not a good source of fibre and nutrients. Choose whole wheat products or multi-grain products like breads, khakhras etc. to increase your fibre intake to aid in weight loss and avoid constipation. 3. Avoid food that is fried or extremely fatty. They provide unnecessary amount of calories, which add to weight gain. It is better to stick to healthy and nutritious food. 4. Drink enough fluids, but not too much. Between 2 – 3 litres a day is a good goal to aim for. Some mothers discover they need much more, and some find that they need to get “just enough” fluids to maintain an optimal milk supply. Liquids can be in the form of plain water, soups, fruit and vegetable juices etc. Try recipes like Strawberry Chickoo Shake, Date and Apple Shake, Spinach and Mint Juice etc. 5. Avoid having sugar-laden juices and carbonated beverages as they only add to the empty calories without being a significant source of nutrients. Stick to fresh fruit and vegetable juices to quench your thirst. However, whole fruits and vegetables are a better alternative to juices as they contain fibre which helps detoxify the body. 6. Have herbs that rebuild the blood lost during birth. Some spices like turmeric help prevent breast inflammation. Include spices like black pepper, ajwain or fennel in the form of Ajwain Roti that help in relieving flatulence and prevent gas formation in the daily diet. Make Mukhwas using fennel, ajwain, dry coconut or use turmeric and pepper to flavour your foods. Alternatively you can sip on Ajwain Water to avoid flatulence. 7. Do not miss out on morning breakfast. Reach out for healthy options like Jowar and Vegetable Porridge, Bulgur Wheat Porridge or a Raab if you feel like having something hot. 1. Keep the meals simple and savour your meals. With the added responsibility of raising a child, it is essential that the meals you prepare are simple yet wholesome. Elaborate meals are difficult to digest in the initial days and will take too much time to prepare, leaving you with no time for yourself and for essential exercises. 2. Eat slowly! It gives your brain a chance to send the 'I'm full' signal to your stomach before you overeat. 3. Avoid eating to the point that you are stuffed and you can’t eat any further. Have just enough till the point that you feel satisfied and full. 4. Avoid serving yourself huge portions of food. If you feel hungry after completion of one portion then you can serve yourself another portion. 5. If you are in the mood of having something sweet occasionally opt for fruit based desserts or opt for dates or dried figs (anjeer) to satisfy your sweet cravings. With such a wide range, lactating mothers are sure to find delightful healthy recipes to add to their daily diet. 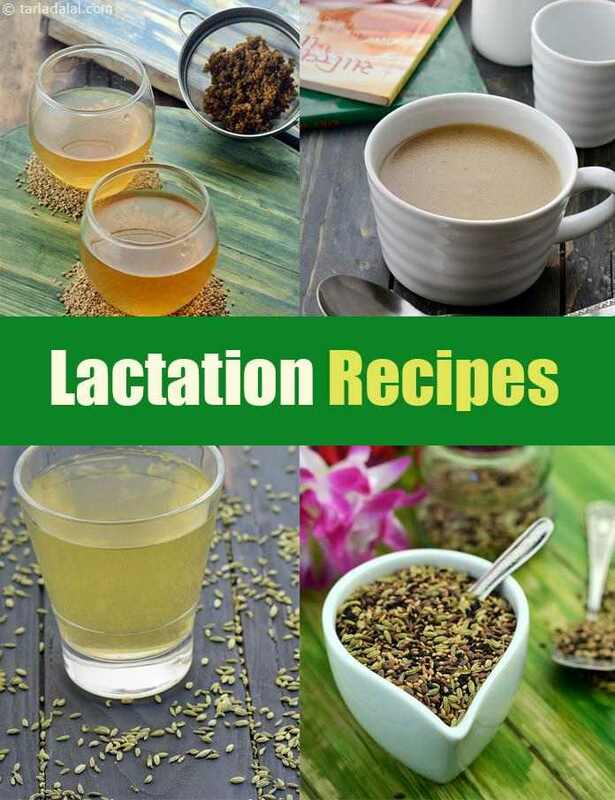 Enjoy our Lactation recipes, Indian Vegetarian Lactation recipes and other lactation articles below.